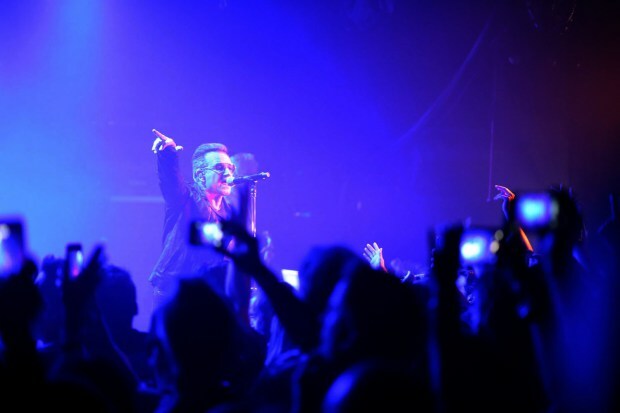 HOLLYWOOD, CA - Right smack in the middle of the 5 night run at the Forum, KROQ working with The Roxy Theatre held a surprise gig for about 500 lucky fans who managed to score free tickets for the event. This was the smallest venue the band has played in many years. The band did come out and spend some time with the fans, signing and posing for photos. Inside the Bono even did a bit of crowd-surfing and amazed fans with a very up close and personal evening. Wednesday night we had a photo of the set list that was to be performed at the Roxy. The photo turned out to be right on the money. The band had a very long sound check that included “11 O’clock Tick Tock”, “The Ocean” “Elevation”, “Stuck In A Moment”, “Sunday Bloody Sunday”, and “California”. The band will head back to the forum to finish out their LA gigs and head on to Denver.